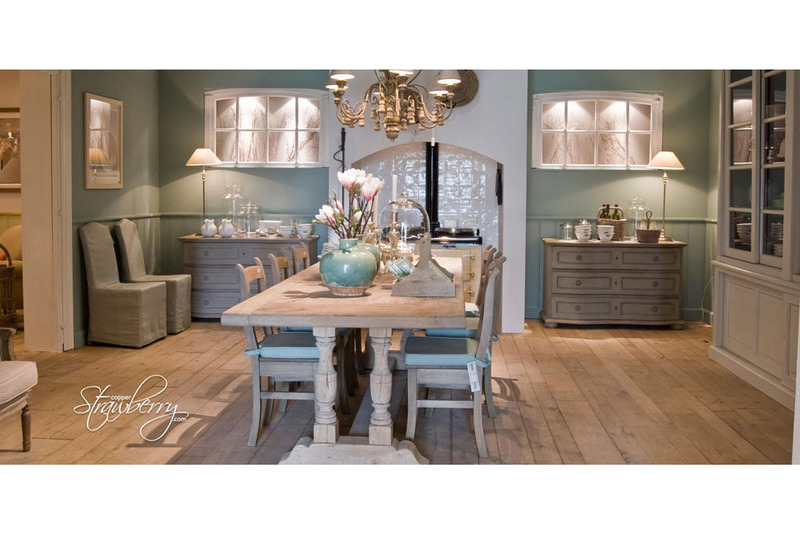 Interiors photography of a contemporary rustic dining setting in one of the showrooms at Flamant Home Interiors in Belgium Europe, for Copper Strawberry. As the Flamant showroom’s had to stay open and fully functioning during our visit, we used only existing ambient light. This area in this shot was lit with a mixture of daylight and warmer tungsten lighting, which we balanced using Photoshop editing software in post production, resulting in a warm and natural look that complimented the products and interior decor. Photography Services supplied incuded – preproduction liaison, clearances, photography, photo retouching, photo file search engine optimisation. Interiors Photographer in London portfolio photograph 4. Modern meets historic, in this bathroom interiors photography at the home of Ryanair founder Dr Tony Ryan, at Lyons Demesne in Co. Kildare, Ireland, for interior designers and fit-out company Trunk Flooring. While we relied strongly on the property’s existing ambient lighting, we used minimal flash lighting to light the shadows and highlight product where necessary. Photo editing software Photoshop was used in post production to further enhance the emotional connection with the target audience in final photograph. Services provided – location scouting, clearances, photography and photo retouching. Interiors Photographer in London portfolio photograph 3. Interiors photography of new bedroom interior design and fittings for Belfast based hotel, bar and restaurant Benedicts. This project entailed photographing the hotel’s exterior, bar area, restaurant, reception and multiple bedrooms to best reflect the recent renovations to the property. Lighting was a mix of the building’s existing ambient lighting complimented with portable Calumet flash lighting, allowing us to fine tune how each room looked and connected with the target audience. 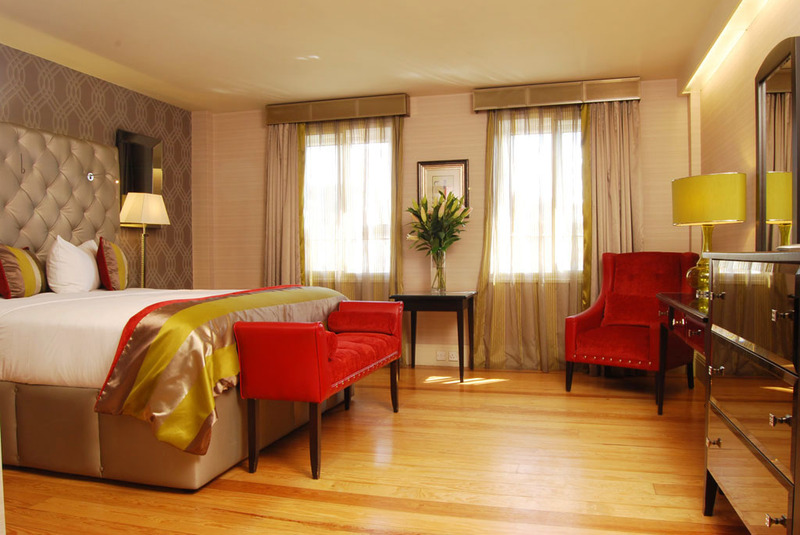 Services provided – location scouting, clearances, interiors photography and photo retouching. Interiors Photographer in London portfolio photograph 2. 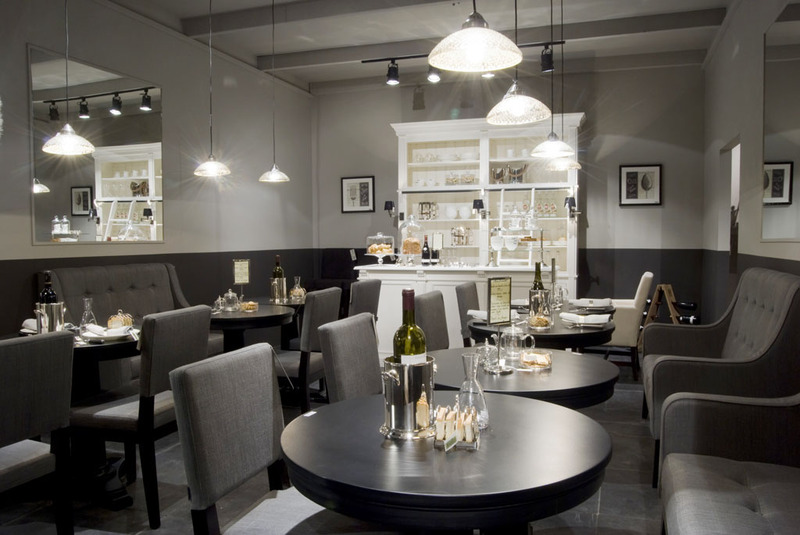 Photography showing a restaurant setting in black and grey, and complimented by a hand made white dresser in the centre of the photograph, at Flamant Home Interiors showrooms near Brussels in Belgium Europe, for European furnishings and bath cosmetics retailer Copper Strawberry. This is one of over one hundred interiors and product photographs taken by our photographer who worked solo (with the client), allowing us to capture as many images as possible during this two day photo shoot. Again, highlight and shadow detail were integrated into the final interiors photograph in post production using Photoshop image editing software. Interiors Photographer in London portfolio photograph 1. 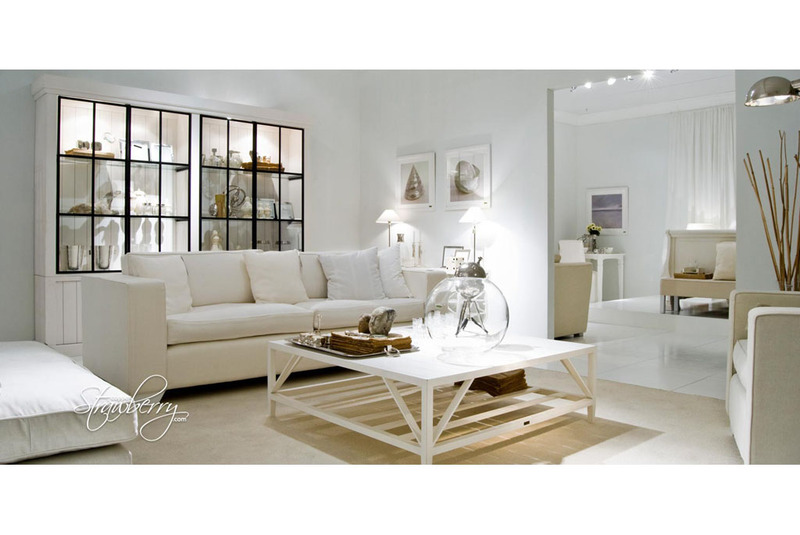 Interiors photography of a striking white living area at the showrooms of Belgian based Flamant Home Interiors, for Copper Strawberry, U.S. based retailers of luxury European furnishings and cosmetics. Using only the showroom’s existing lighting (avoiding any disruption to Flamant’s showroom activities), we integrated shadow and highlight detail within this photograph in post production, using professional photo editing software, resulting in natural looking interiors photography that best reflected the ambience in this, one of Europe’s finest, interiors and furnishing retail and manufacturing company’s.